First let us just get this out of the way. No, the Inside Out Slim Leather Wallet has nothing to do with the Disney Pixar movie of the same name. So rest assured there is no Joy, Sadness or any movie character brightly emblazoned on the wallet. What you do get however is a very reasonably priced and handsomely made slim leather wallet that is hand stitched in Chiang Mai, Thailand. The Inside Out Slim Leather Wallet is a sleeve wallet that features 2 vertical card slots on one side, a horizontal card slot on the other side and sandwiched in between is a large pocket that is perfect for storing cash. Each of the card slots can hold 1 to 2 cards which gives you a total of 6 cards. You can also use the center cash pocket for storing more cards of course. What we loved the most about the Inside Out Slim Leather Wallet is the look of the wallet or specifically the “distressed” leather look. Distressed leather refers to leather that is artificially aged to give that worn out look. If you like your brand new leather wallets to have that glossy and brightly polished look, this is not the wallet for you. 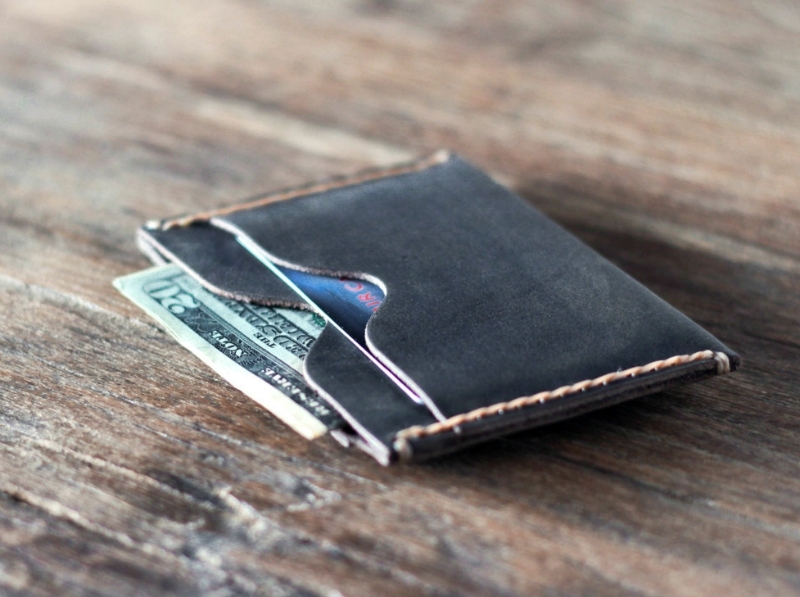 In fact the wallet’s leather surface scuffs easily and it is designed to do just that. While it already looks a little worn right out of the box, with a little use, it looks like a family heirloom wallet that you have been using for years. Another interesting fact about the Inside Out Slim Leather Wallet is that each wallet is made to order. Each wallet takes 1 to 3 days to produce and no two wallets are exactly the same. Each wallet is custom made by hand and is one of a kind. Wallets are shipped from Thailand and will take 2 to 4 weeks to reach the US although option for expedited shipping is available. The Inside Out Slim Leather Wallet has the full functionality of a bifold wallet but comes in the shape and size of a simple minimalist sleeve wallet.